This comprehensive and instructive study examines the relative success or failure of government policies in preventing and alleviating unemployment. Choosing two contrasting cases—West Germany and the United States—Thomas Janoski probes the causes and consequences of two very different orientations toward labor market policy. In West Germany, labor, employers, and government cooperate in the running of a powerful and effective employment service. In the United States, by contrast, one finds little state involvement, organizational confusion, a long history of poor funding, and legislative resistance to intervention in the labor market. In the author's mind, these inadequate policies have had deleterious consequences for the American labor force. Whereas a skilled and flexible labor force exists in West Germany, Americans are poorly trained and barely assisted in finding jobs and training. To remedy this situation Janoski puts forth bold and useful policy recommendations, including the creation of a new organization to operate in national labor markets, the development of technical training programs in high schools, and the creation of a youth service to prevent teenage crime. 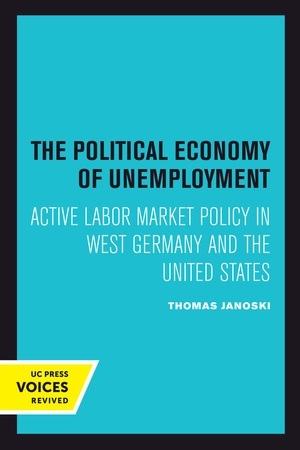 The Political Economy of Unemployment offers a trenchant examination of how modern industrialized nations deal with the vicissitudes of the economy and how they might develop and implement more effective labor market policies. Meticulously researched, it is an important contribution that policymakers and social scientists will find provocative and useful. This title is part of UC Press's Voices Revived program, which commemorates University of California Press’s mission to seek out and cultivate the brightest minds and give them voice, reach, and impact. Drawing on a backlist dating to 1893, Voices Revived makes high-quality, peer-reviewed scholarship accessible once again using print-on-demand technology. This title was originally published in 1990. Thomas Janoski is Professor of Sociology at the University of Kentucky.